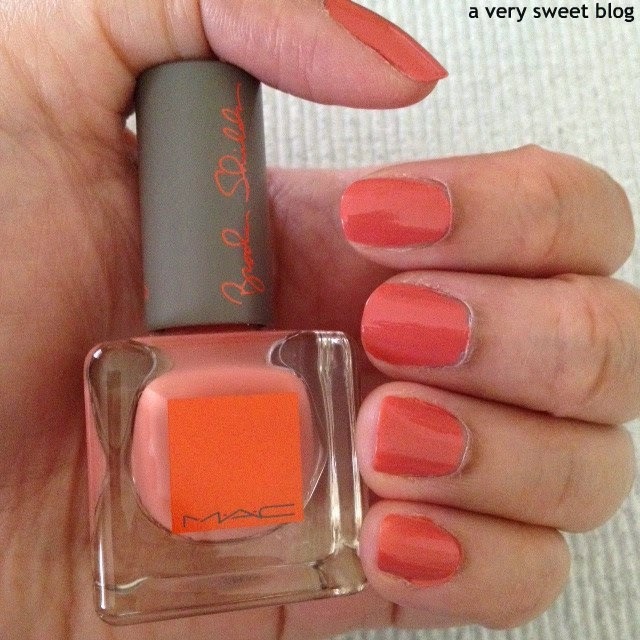 So what nail lacquer, compliments Benefit's Majorette blush (yesterday's post)? Brooke Shield's 'Dignity'. MAC came out with a Brooke Shields Collection in September. I love Brooke Shields, but nothing from her collection really WOW'd me at first. So after everyone purchased the collection, blog posts started popping up. I looked at the reviews and one item in particular item caught my eye...DIGNITY (peach looking nail lacquer). The color looked GREAT on everyone! I purchased it and ABSOLUTELY LOVE IT! It's different from the corals I have. It's Fall. It's peachy. It's salmon. It has a tinge of brown in it. While I was swatching it for you below, I said to myself this would go great with Benefit's Majorette blush. Great color. Nice gloss. And this wears for 4-5 days. Just 1 coat on my nails below! Ignore my cuticles, I've got to schedule a professional manicure soon. LOL And I've got to get another bottle of this. Have a PEACHY weekend! I'll be blogging from Memphis, Tennessee next week! So be sure to stop by, to catch my posts! 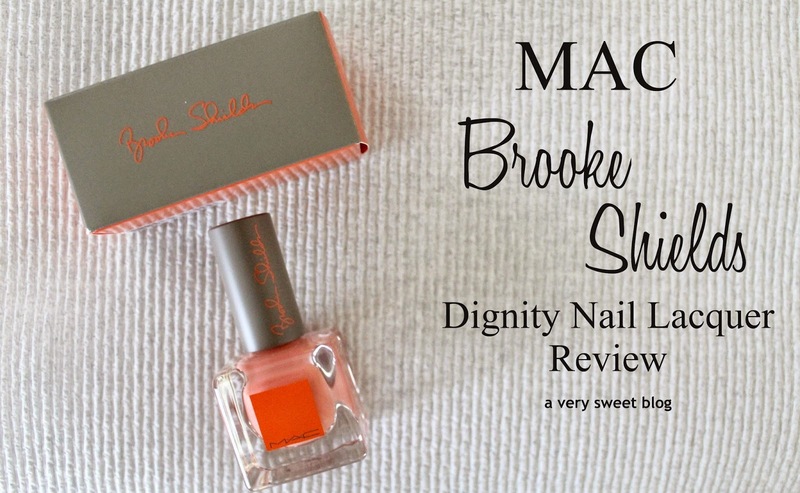 MAC Cosmetics Brooke Shields Dignity Nail Lacquer is Supersweet. This is a beautiful shade of nail polish! That's pretty impressive it only takes one coat of polish to coat your nails! Great post! i like that is is not a strong color! The color is perfect and pretty on you have wonderful weekend. I love this color!!!! so perfect for fall :) :) :) and it's duration is not bad at all... as I said before, if you rate supersweet... it is probably amazing! Have a great time in Tennessee! What a nice colour indeed! It's great that you found this nail lacquer and you are happy with it! It would be interesting to see your upcoming posts from Memphis! Have fun! Gorgeous color! I have never tried any of their nail polishes before! This color is a perfect complement to your Benefit Blush Kim! And it's also so sweet and pretty! Happy weekend! That is a gorgeous a color!! And it does compliment the blush from yesterday!! I love the packaging of that Polish bottle too! Such a pretty coral! And your right, perfect for fall. Absolutely loving it! Nice color! I don't think I've ever seen peach nail polish like this before; very unique! That's a gorgeous shade of peach. I'm really loving it, so glad that you reviewed this one as I was seriously considering getting it when I first saw it. I just love peach colors. Will be adding that to my list now! That is a great coral-peach-salmon color! I'm usually pretty "meh" about either of those three, but (as you stated) the hint of brown makes it a great fall color! Also, it keeps it from being too bright! Is a beautiful color, ideal for halloween too! I'm a Brooke fan and i agree this colour is beautiful. That is such a lovely shade of polish and I can definitely see it being flattering on everyone - the colour is beautiful on you! Such a lovely colour and that is impressive being one coat. Hey Kim, I fell in love with it when you posted it on IG. It's gorgeous and I bet it's nicer in reality. Have a great weekend! I feel like I am forever looking for the perfect shade of coral, not too pink, not too orange, not too pale... would love to check out this shade for myself! While i do think it is a very pretty color, it doesn't look like the color stamped on the nail polish bottle itself. It looks rich. Nice! I'll have to run and try the one that you say. It's been a longgg time since I did a home mani. This is a fantastic shade indeed: something between orange and coral, it looks great on you. very nice color and review! I didn't know Mac did nail varnish??? Lovely colour. Have a great weekend. what a pretty coral! this color suits you Kim :) I hear you, Furla has so many cute bags, it is hard to decide! What a lovely shade! It reminds me of a lovely summer day! yes. i LOVE the color! and i love brooke shields too! i like the look of the packaging and bottle. pretty color! This color looks amazing on you. I pinned it! Thanks for the recomendation. What a hot color! Love it.